High powered vacuum sealers get the job done with ease! It is perfect for protecting domestic meats, game, fish, and vegetables. 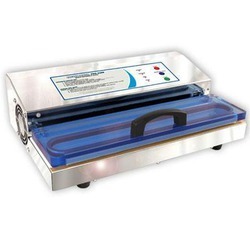 This is a commercial-grade vacuum sealer with an extra large teflon bar for sealing bags up to 15" wide. Double piston vacuum-pump delivers 28" HG vacuum strength with 935 watts of power. Automatic Mode has simple one-touch vacuum-too-seal operation. Manual Seal Mode lets you control the amount of vacuum pressure for sealing soft foods, photos, valuables or delicate objects. Detachable power cord with convenient cord storage compartment. 25 - 6" x 10", 15 - 8" x 12", 10 - 11" x 16"